Thanks for coming around and checking out our review of Easton Archery’s Beginner Recurve Bow Package. This starter kit is designed with the young archer in mind, so let’s see how well it fits that audience. Unfortunately, there’s no bow stringer included, but you will find everything else your young archer needs to get started. Since the bow comes preassembled, you won’t have to do anything other than insert the sight pin and attach the stick-on arrow rest. I would suggest purchasing a bow stringer separately, since one doesn’t come with the bow. It’s important for an archer to learn how to take down the bow, and the only safe and correct way to do so is using a bow stringer. You won’t be able to use any accessories with this recurve, unfortunately. While it’s definitely designed with beginners in mind, you should still make sure you take some time to properly tune the recurve bow before you get started. 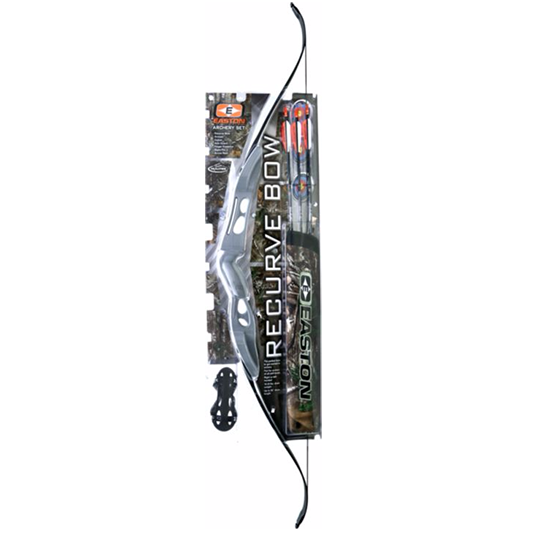 Easton Archery has developed this recurve bow to have a variable draw weight of 10 to 20 pounds, depending on the length of your pull. If this sounds too light for you or your archer, you should choose a different bow. Check out our guide on selecting the right draw weight for more information. Accuracy is surprisingly good with this model. My nephew has become a pretty accomplished young archer, and was able to maintain 3-inch groupings from 45 yards with Easton’s beginner recurve bow. Absolutely not. With a draw weight of just 10# to 20#, you won’t be able to make a humane kill shot on anything bigger than a squirrel or rabbit. On top of that, most states require a draw weight of at least 40# for hunting medium game or larger. Will Beginners Be Able To Learn With The Easton Beginner Recurve Bow Package? Since it comes with everything you need to get started, and it has a light draw weight, this is almost the perfect choice for a youngster new to archery. You might not be able to hunt with this recurve, but your young newbie to archery can certainly begin learning the stance and technique for proper archery. It’s very forgiving, so newcomers to the sport can learn without getting frustrated. You’ll find three arrows in the package, but you may want to buy more. Since choosing the perfect arrow is beyond the scope of this review, be sure to check out our guide on arrow selection for more information. 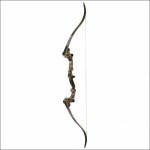 This recurve is built from a polymer riser with glass-reinforced limbs. It’s surprisingly rugged, and takes a beating while keeping on ticking. Even though I recommend unstringing a bow when you’re done shooting, this model has sat strung for quite a while without a hint of limb twist. You get the perfect string with the bow, and your archer will probably outgrow it before it wears out. 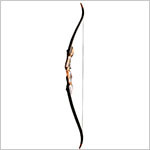 Still, if you find you need a new string, any regular Dacron string for a 52-inch bow will work fine. Just don’t try using a Flemish twist or Fast Flight string, though; the recurve doesn’t have reinforced limb tips. At just 1.3 pounds, this is one of the lightest bows I’ve come across. In fact, it’s almost too light, and my nephew had to overcome an urge to raise the bow higher than intended. It’s surprisingly quite for such an inexpensive bow, probably owing to the use of polymer for the riser. There is a bit of hand shock and vibration, unfortunately, and my nephew noticed that pretty quickly while shooting. Blame that on the polymer construction and light weight of the bow. Thanks for reading my review of the Easton Beginner Recurve Bow Package. This is a great starter kit for a new archer, but it’s not without its flaws. It’s a bit too on the light side, suffers from a fair bit of hand shock and vibration, and isn’t set up for any accessories. That said, it’s still a great choice to get someone their start in archery. 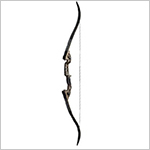 Take a look at current price on the Vista Sage Recurve Bow if you’re interested in buying.